Will make about 10 muffins or the ingredients can be successfully doubled. Great for school lunches with no nuts, packed with protein, fibre, and healthy fats for brain power. Whisk eggs add syrup, vanilla and coconut oil (you may need to heat it slightly to melt it, and let it cool.) Combine well. In another bowl sift coconut flour, baking powder, and salt. Slowly combine flour to egg mix and stir till a batter consistency (sometimes I use my stick blender to make sure there are no blobs.) 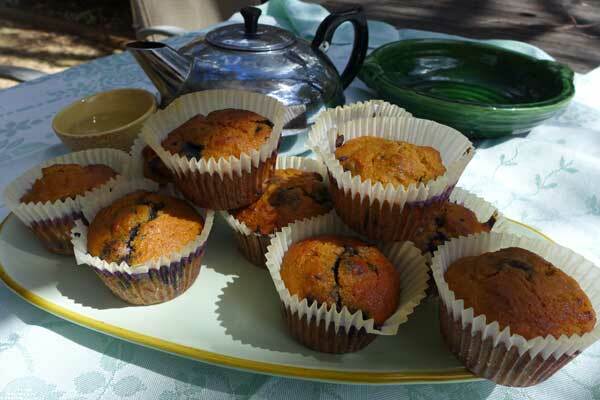 Stir in the blueberries gently then spoon into muffin trays lined with paper muffin cups.